How big do prairies need to be? There is an awful lot we still don’t understand about prairies (and the rest of the natural world, for that matter). First and foremost, we haven’t even come close to discovering all the species that live in prairies. We have probably identified all of the birds, and most of the other vertebrates, but there are still many prairie invertebrates no one has yet described. The world of microorganisms is beginning to open up to us, but that is still, by far, the biggest pool of unknown species. How can we manage a natural system when we don’t even know what’s there – especially when those inhabitants have a tremendous impact on ecosystem function? It’s possible that we’ll find more snake species in North American prairies, but we’ve surely discovered nearly all of them. 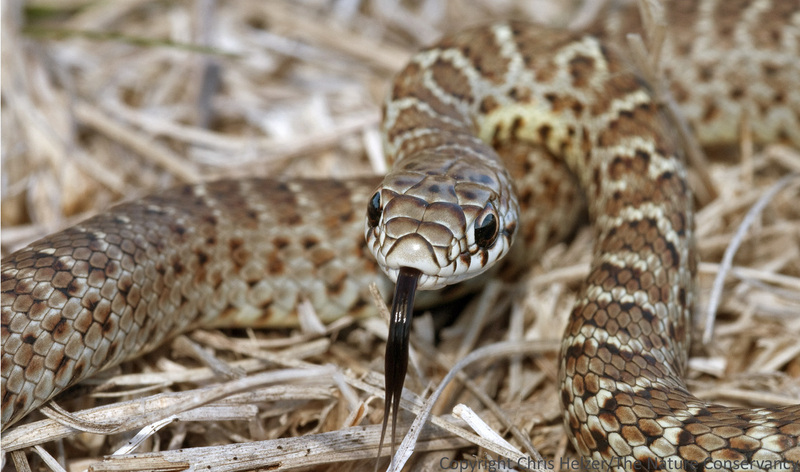 This one is a juvenile eastern racer (Coluber constrictor) in TNC’s Platte River Prairies, Nebraska. We need to discover more species and understand the basics of their life histories, but there are some other really big prairie questions out there that need attention as well. I thought I’d share a few of the ones I think are most important. I’m hoping you’ll find them thought-provoking and join me in trying to chip away at them. We’re not going to answer any of them in the near future, but more people thinking about them and making careful observations will speed us more quickly along the path. Because each question takes some explaining, I’ll just deal with one here and cover the others in future posts. Big Question #1: How big and connected does a prairie landscape need to be to support the majority of prairie species and essential natural processes? This one has bothered me for a long time because not knowing the answer prevents us from setting reasonable goals for landscape-scale conservation efforts. As prairie landscapes get carved up by rowcrop agriculture (e.g., the Dakotas), how do we know how much fragmentation will be catastrophic to the ecosystem? On the flip side, in landscapes that were carved up long ago, what size prairie restoration projects should we aim for to truly restore sustainable prairie ecosystems? We know that some prairie species require large patches of habitat. Based on quite a bit of research on birds, we can make reasonable guesses about the size of prairie landscape needed to maintain populations of most bird species. I’m not completely up to date on this research topic, but I think it’s fair to say that if you had a couple thousand acres of prairie and managed it for a diversity of habitat structure, you’d see most of the grassland bird species in your region show up to nest. To ensure that those populations were large enough to survive tough years, it’d be nice to have more like 5,000 or 10,000 acres. Depending upon where you live, that might sound like an impossibly big number or a very manageable one (Illinois doesn’t even have 10,000 acres of remnant prairie in the state, while 10,000 acres is pretty small for a ranch in the 12 million acre Nebraska Sandhills). Upland sandpipers are found most often in larger prairies, especially those with relatively short vegetation. Assuming that 10,000 acres is a comfortably large prairie for grassland birds, you might think we could just use that as a benchmark for other species as well. Unfortunately, there are a number of problems with that assumption, many of which I laid out in an earlier post. One big problem is that bird habitat (quantified largely by factors like vegetation structure and insect abundance) is not necessarily quality habitat for pollinators, ants, or many other species that rely on high plant diversity. Each of those other species has particular needs, both for habitat size and habitat quality. A few species (bison? prairie dogs? others?) might need considerably more than 10,000 acres to support a viable population. However, many other species probably need considerably fewer. In fact, 10,000 acres might seem like an entire universe to many invertebrate species – although the more we learn about insect migrations, the more complicated that picture becomes. 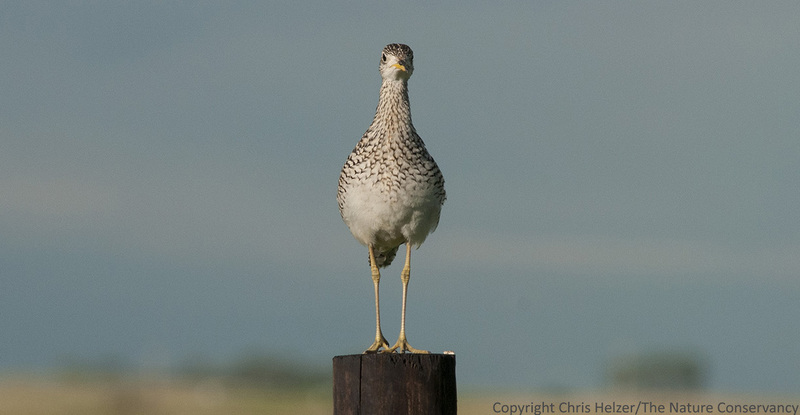 Is 10,000 acres enough to provide for the vast majority of prairie species? Maybe. We really don’t know. 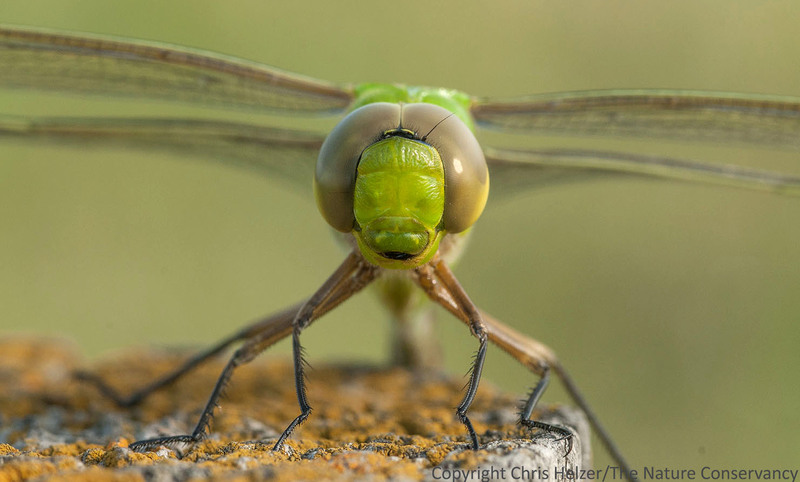 Green darners, and many other dragonfly species, migrate long distances. So do a number of moths and butterflies. Other invertebrates can also travel long distances. Does that make them more or less reliant on large prairie blocks? Why is this so important? I’ll give you two real world examples. First, think about a prairie landscape that has been relatively intact for thousands of years, but is now becoming fragmented by a rapid increase in new rowcrop agriculture. This is a situation all too familiar to conservationists in the Dakotas, where millions of acres of prairie have been converted to rowcrops over the last couple of decades. As those conservationists struggle to protect remaining prairie through conservation easements and other strategies, they are doing so with limited time and money. Knowing what size a prairie block needs to be to sustain species and ecosystem processes would be tremendously helpful. Let’s say an organization obtains a conservation easement that prevents 5,000 acres from being farmed. Should they prioritize obtaining an additional easement next to it so that if everything else in the county gets farmed up, there will still be a 10,000 acre block of prairie remaining? What if they have to pay double the price to obtain that second easement? Is it worthwhile? Or should they spend the same amount of money on two more 5,000 acre easements in other locations? Not knowing the answer to what seems a pretty basic question makes it really difficult to know how to proceed. My second example is at the other end of the spectrum. There are a number of large scale prairie restoration efforts going on around North America, where thousands of acres of cropland are being restored to high-diversity prairie communities. The best of those start with a number of unplowed prairie fragments and enlarge and reconnect those through restoration. The complexes of interconnected remnant and restored grassland they build are many thousands of acres in size. The Nature Conservancy’s Glacial Ridge project in Minnesota, Nachusa Grasslands in Illinois, and Kankakee Sands project in Indiana are all great examples of this, as is the US Forest Service’s Midewin Tallgrass Prairie in Illinois. We have proven that we can rebuild prairie landscapes of 10,000 acres and larger. The sites look good, with beautiful plant communities and abundant wildlife, but are they big enough to sustain that biological diversity? Should those sites be spending $15,000 per acre to buy high-priced cropland around their borders and increase the size of their restoration projects? Or should they invest those funds in invasive species control and other management needs to protect the investment they’ve already made? Unfortunately, the answers to these fairly simple questions are not going to be simple to obtain. We and others have taken a few baby steps by comparing the diversity and abundance of invertebrate species among prairie fragments of varying sizes and degrees of isolation, but we’re just getting started. 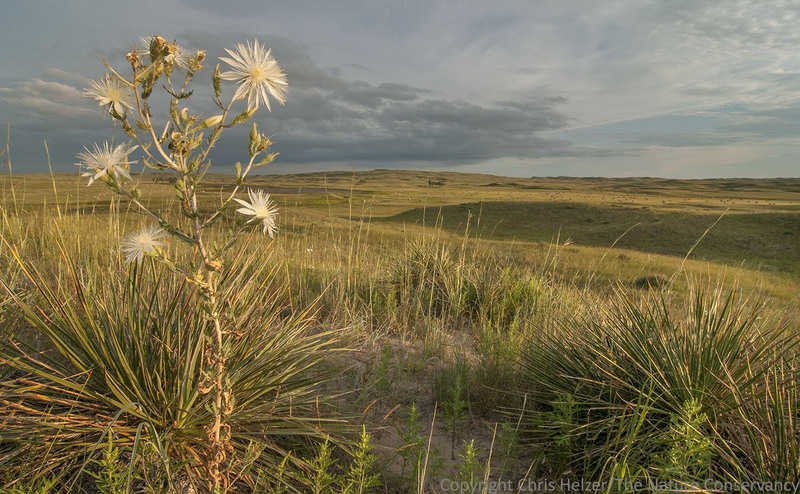 I think a better approach would be a large collaborative project that focuses on some of our largest, most intact prairie landscapes such as the Sandhills of Nebraska and the Flint Hills of Kansas and Oklahoma. Studying how populations and ecosystem processes differ between core areas of those landscapes and the fragmented edges would be an excellent start. We could learn which species might be most vulnerable to the negative impacts of fragmentation, and then focus on those species through additional research looking at how they are doing in prairies of varying sizes across their ranges. We can learn a lot by studying how species do in the core versus the ragged edges of huge intact prairie landscapes like the Nebraska Sandhills. I’ve planted this idea with quite a few people, but nothing has really taken off yet. I’m not giving up. This is too important. Does anyone have a couple million dollars to spend answering one of the most pressing conservation questions of our time? Here are a couple other examples of big research questions I think about. I’ll address them in more detail in future posts. 1. How effective is prairie restoration (converting cropfield to high-diversity prairie plant communities) at defragmenting prairie landscapes? Do populations of plants, insects, and wildlife in small prairie fragments grow larger and more interconnected when surrounding cropland is converted to prairie? What are the key ecosystem components that need to be restored in order for that to happen? 2. How do prairie species respond to fire and grazing management patches, and how should that affect the scale and frequency of those management treatments? What happens to a vole or other creature living in the unburned patch of a prairie when that patch burns? Can it travel to other suitable habitat? How does it know where to go? What kinds of habitat can it cross and how far can it travel? 3. How does plant diversity influence the productivity and sustainability of grasslands, especially in ways that directly influence agricultural production? Why should a rancher care about the plant diversity of his/her pasture? Are there demonstrable increases in soil health, pollination services, forage productivity, forage selection, etc., and are those strong enough that a rancher would trade slightly lower annual income for them?